Map: Go to MyFWC.com/News and click on the headline for this story. Blue crab traps may not be in state waters (shore to 9 nautical miles, including intracoastal waterways) from the Florida/Alabama state line through the Franklin/Wakulla county line from Jan. 5 through 14. Waters of the Ochlockonee River and Ochlockonee Bay are not included in this closure. Lost and abandoned blue crab traps are a problem in the blue crab fishery, because they can continue to trap crabs and fish when left in the water. They can also be unsightly in the marine environment, damage sensitive habitats and pose navigational hazards to boaters on the water. The closure is one of three regional, 10-day blue crab trap closures that will occur in 2015. 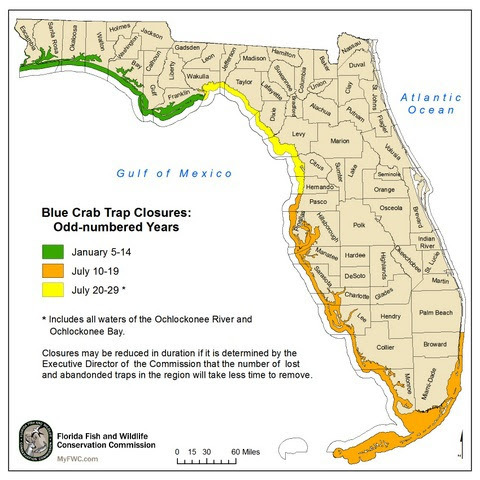 Coastal waters from Broward through Pasco counties will close to traps July 10-19, and waters from Hernando through Wakulla counties, including all waters of the Ochlockonee River and Ochlockonee Bay, will close to traps July 20-29. There are six regional closures total: three in even-numbered years on the east coast and three in odd-numbered years on the west coast (see map). For more information regarding the FWC’s trap-retrieval program, blue crab trap closure dates, regulations and cleanup events, go to MyFWC.com/Fishing (click on “Saltwater Fishing,” then “Trap Retrieval/Debris Removal”). For additional information, contact the FWC’s trap-retrieval coordinator, Kyle Miller, at 850-487-0554.